When looking at white gold jewellery in a high street jewellers, the sales assistants will often talk about having it ‘dipped’. Another term sometimes used is ‘rhodium flashing’. Both of these terms conjure images of simple and almost magical processes involving either vats of liquid metal or zapping the piece of jewellery with a special rhodium gun! I don’t blame the sales assistants one bit; it is merely a lack of understanding of the process of rhodium plating (the actual name for the process). Big jewellery brands will train their staff with these terms for rhodium plating, and this has been a conscious decision. ‘Dipping’ and ‘Flashing’ sound slightly mysterious and inoffensive. ‘Plating’ on the other hand sounds cheap. It sounds like something is being covered up and hidden, and the metal that is being plated therefore seems less attractive and valuable – which is completely not the case! So what is rhodium plating? Plating is a process used to change the colour of precious metal. To plate a piece of jewellery, it is first cleaned up to remove any residue that could stop the rhodium from fusing with the metal. 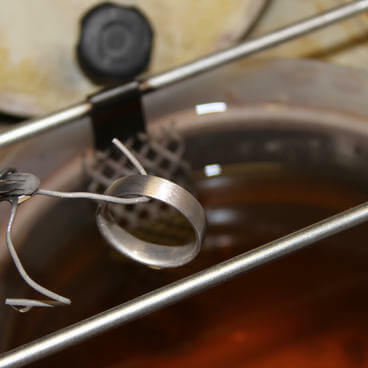 An electrical current is then run through the piece of jewellery while it is suspended in a plating solution. Tiny particles of rhodium will attach to the surface of the metal and produce a bright, cold white colour. Traditionally, this plating is put over white gold to give it the bright white colour of Platinum. The plating is normally around 0.75 to 1.0 microns thick. Any thicker and it can crack due to rhodium’s inherent brittleness, and any thinner and it will wear away very quickly. Rhodium is from the same family of metals as Platinum. It is very hard and therefore not suitable for fashioning into jewellery, but works well as a plating metal. Some people think a layer of rhodium plating adds durability to the piece, but as it is so thin, I am on the fence about this. In the past, white gold alloys were not very successful. Their colour was poor and they had some nickel content which can cause an allergic reaction. Rhodium plating was used as a barrier to protect the wearer from this risk. In the UK, nickel is now banned from precious metal alloys so this is a non-issue. In the US, gold jewellery comes in varying standards with different nickel contents. White gold alloys have been much improved. The colour, although not the bright white of Platinum, are much whiter than they used to be. When held next to Platinum, side by side, you would notice a difference – 9ct white gold has a pale, creamy hue to it while 18ct white gold has a darker, almost gun metal quality to it. But in all honestly, in isoloation, I doubt the average person on the street would notice a difference – you’d have to be looking for it. 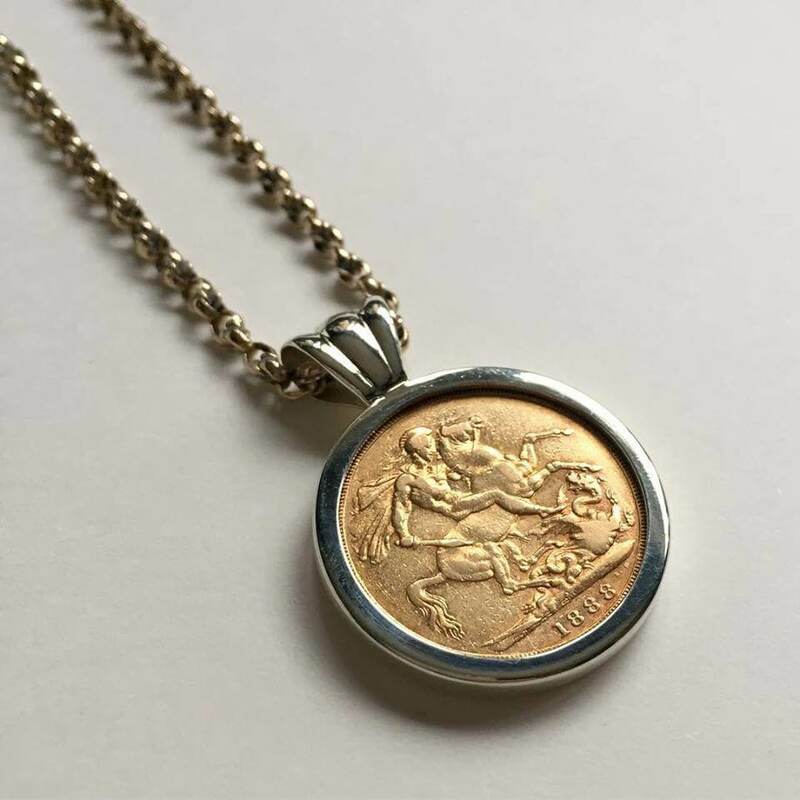 The natural 9ct white gold of Nadeen’s handmade sovereign pendant looks bright white next to the yellow colour of the coin and rose gold of the vintage chain. Some silver jewellery is also rhodium plated as silver has the downside of tarnishing. Rhodium does not tarnish so, therefore, gives the bright white colour we associate with silver jewellery without the need to polish between uses. What are the cons of rhodium plating? 1. Any sort of plating is not permanent – it is a thin coating on the outside of the metal that will wear away over time. How quickly this happens depends on what type of jewellery it is and each individual wearer. Each time you have the piece re-plated, it will be re-polished first, meaning metal will be lost. Over time, this will add to the wear and thinning of your jewellery. Plus you’ll have to be without your precious jewellery for up to a couple of weeks while it is done. 2. Plating cheapens the beautiful metal it covers up. White gold alloys are now beautiful in their own right and the lack of nickel in the mix (in the UK) means there is simply no reason to add this barrier layer. You may even find that the tone of natural, un-plated white gold suits your skin tone better than the icy white of rhodium plated metal. 3. On the other hand, if the cool tones of rhodium or Platinum appeal to you, but you can’t stretch to the cost of Platinum, you can always consider Palladium. When it became compulsory to hallmark Palladium in 2010, the ‘need’ to plate white gold to get the Platinum look disappeared. Palladium comes in somewhere between 9 and 18ct white gold in terms of cost, meaning it has become a good value alternative to pricery Platinum. You can find out more about Palladium here. These are just a few of my arguments against rhodium plating. This is a topic I have covered in a number blogs, so if you’d like to read more on the matter, please take a look at the links below. I’d love to hear your thoughts on rhodium plating in the comments below, and if you’d like to discuss a bespoke jewellery commission using non-rhodium plated white gold, get touch here.